FUBAR: By The Sword #2 Released! Go to your local shop and pick up the latest issue of the FUBAR press empire, FUBAR: By The Sword #2! History becomes even more horrifying as FUBAR returns with an all new giant-sized two issue miniseries! 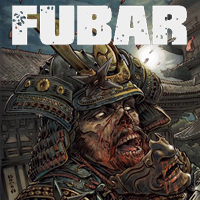 The second over-sized issue shows what happens when FUBAR goes feudal Japan on the living dead with five brand-new stories of zombie samurai madness! I have a story called "The Grove," a Rashomon flavored tale about a bounty hunter, an old blind priest and a woodcutter and their individual perspectives on a mysterious zombie attack in the woods. The Grove is illustrated by Peebo Mondia.